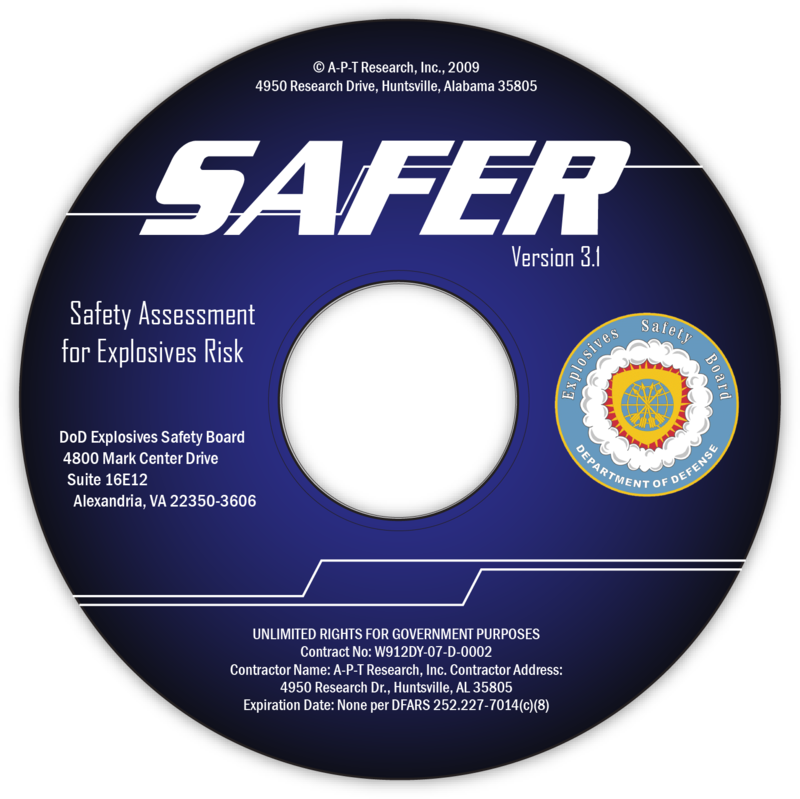 Safety Assessment for Explosives Risk (SAFER) » A-P-T Research, Inc.
Safety Assessment for Explosives Risk (SAFER©) is a software model that was developed for a joint Services and DoD Explosives Safety Board (DDESB) Working Group. SAFER performs quantitative risk analysis to determine risk to people from a potential explosion site (PES) by conducting a sequential calculation of probability of event, explosives effects, and personnel exposure. SAFER can be used to assess the risks to people in inhabited building distance (IBD), public traffic route (PTR), and intraline distance scenarios. The U.S. currently uses Quantity-Distance (Q-D) criteria as the basis for siting explosives facilities. The Q-D method considers explosives quantity, Hazard Division, and PES type to determine a safe separation distance. The SAFER model was developed to assess risks using additional considerations such as the type of activity at the potential explosion site (PES), the number of people at the exposed site (ES), and the building construction of the ES. What data do you need to run SAFER? Since the SAFER model is menu-driven, the user must make judgments as to which menu item best fits the situation under analysis. These judgments require knowledge of the explosives and the building construction for the PES and ES, and the average annual exposure of the personnel. The SAFER model is intended to be used by safety professionals. The individual should have some knowledge of the application of Q-D principles, explosives Hazard Class/Divisions, explosives quantity, and information concerning the facilities and personnel surrounding the PES and the ES. Is SAFER approved for use by the DDESB? Yes – the DDESB approved the trial use of the SAFER model and acceptance criteria for siting waivered PESs in December 1999 and extended the trial period in December 2001. The trial period ended in December 2004. APT offers a two day training course on SAFER. The course is designed to train the user on the overall user interface of SAFER. Some of the topics discussed are below. A background on the concepts and terminology used in the SAFER risk assessment software. How to install the SAFER software. A thorough guide on using input screens and choosing the proper input selection. A description of the capabilities of SAFER including menu options, functions of the tool bar, help menu and generating reports. An overview of the 26-step process used by SAFER to familiarize the user with the exposure and consequence analyses. Multiple examples (some worked individually and some as a group) demonstrating the various capabilities of SAFER. SAFER Training is available to U.S. Government personal and their contractors.